Marriott International and Dur Hospitality today announced the opening of Riyadh Marriott Hotel Diplomatic Quarter and Marriott Executive Apartments Riyadh, Diplomatic Quarter in Saudi Arabia. The complex is located 30 minutes from King Khalid International Airport. Meeting high standards for energy and environmental (LEED) Gold Certification requirements, the hotel site creates a protected micro-climate and maximizes on environmental impacts. By amplifying useful daylight via a complex reflection processes, the hotel can decrease its illumination needs during the day. Plentiful shaded areas and the building’s structure allow for natural ventilation, reducing the need for air conditioning and additional cooling. Courtyard Port of Spain starts 2019 with newly renovated rooms providing guests a new experience of luxury and modernity, with designs created to keep the Courtyard guest room brand and provide opportunities to the guests to be their most creative and successful selves. The renovation consisted of 119 guest rooms and suites and involved a complete gutting and upgrading of bedrooms and bathrooms. The rooms are modernized with the latest innovations in technology while highlighting the contemporary feel that provides flexibility and allows guests to optimize and elevate their travel experience. The Courtyard brand is always up to date with trends and evolves to achieve the guests’ expectations. The new design offers hybrid zones for work, sleep and relaxation. Indirect lighting and neutral tone-on-tone colors makes for a soothing and calm environment. Colors like beige, white, blues and greens are also present to portray the Caribbean destination. “The rooms are more versatile. The business traveler will have different options to work and relax comfortably. The bathroom now features a large walk-in rain shower, the rooms also have elements inspired by clear woods. The multiple spaces of the new guest rooms are the perfect example to the Courtyard brand identity: Fueled by Passion, the flexibility of the spaces will provide the guests more comfort to be their most creative and successful selves” commented Nicol Khelawan, General Manager of Courtyard Port of Spain. Trinidad and Tobago is one of the most wealthiest nations in the Caribbean, where the tourism industry is growing and represents an important part of the islands economy. With beautiful white beaches and natural landscapes, the country is also known for its annual Carnival celebration as well as being the birthplace of Caribbean rhythms as the calypso. Courtyard Port of Spain located in the capital of the country is 45 minutes from the Piarco International Airport and only 10 minutes from the City Centre. Located very close from Movie Towne Shopping & Entertainment Centre, the hotel provides business centers, restaurants & bars, a 24-hour market, valet laundry, self- service coin laundry, fitness facilities, onsite taxi service, free wireless internet access in public areas and guest rooms as well as a tour coordinator. 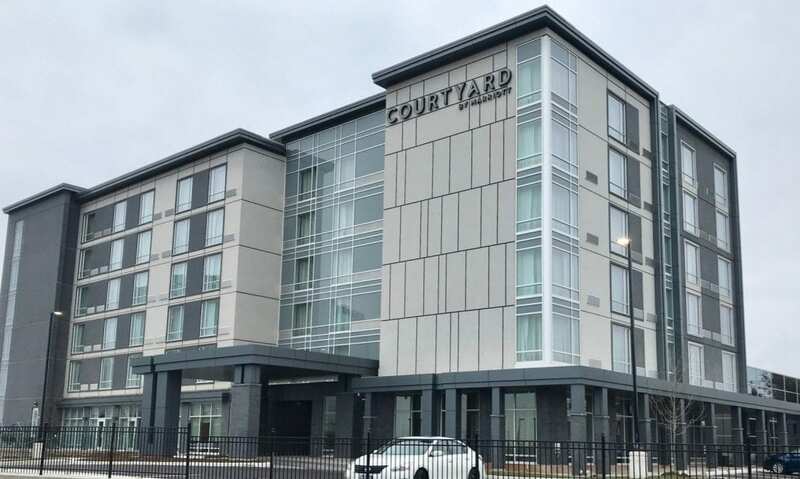 Courtyard is the hotel brand of choice for ambitious and enterprising guests who see business travel as a driver of personal fulfillment and professional growth. Courtyard provides opportunities for guests to pursue both their personal and professional passions on the road. With more than 1,100 locations in over 50 countries and territories, Courtyard is proud to participate in the industry’s award-winning loyalty program, Marriott Rewards® which includes The Ritz-Carlton Rewards®. Members can now link accounts with Starwood Preferred Guest® at members.marriott.com for instant elite status matching and unlimited points transfer. For more information or reservations, visit courtyard.marriott.com, become a fan on Facebook or follow @CourtyardHotels on Twitter and Instagram.